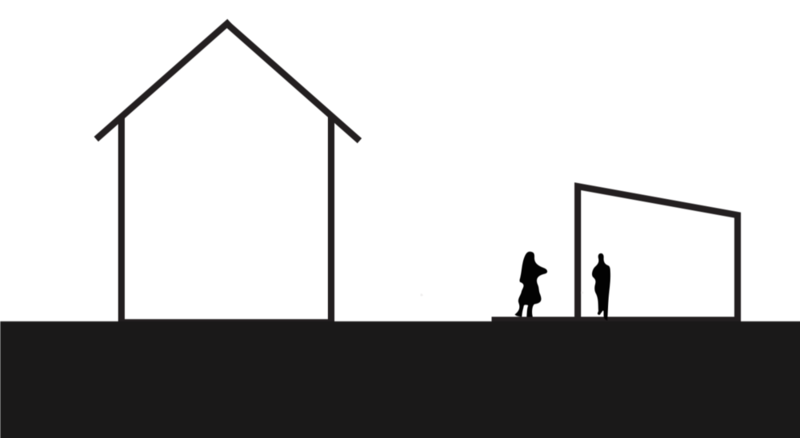 Last month, Tacoma legalized backyard cottages and relaxed restrictions on accessory dwelling units (ADUs). Changes to the current ADU code are intended to increase the availability of these modestly sized, relatively affordable and green housing types by removing some key barriers that previously discouraged property owners from creating an additional dwelling on their lot. Notably, ADUs attached to the main home have been allowed in most residential zones in Tacoma since 2013, however only 62 have been permitted over the last five years. Further indicating that demand was held back by restrictive rules, permit applications for ADUs jumped significantly in Bellingham and Vancouver, Washington immediately after those cities loosened their ADU regulations. Having closely followed the lengthy public outreach process here in Tacoma, WC STUDIO heard an outpouring of support and interest from the community and we are optimistic this trend will be repeated here. Common ADU types such as attic or garage apartments and additions have been allowed in most residential zones in tacoma since 2013. Under the new regulations DADU will also be allowed in all residential zones. However only 62 have been permitted due to rules that discouraged owners from adding or legalizing existing non-conforming units. Examples include free-standing studios, backyard cottages, and apartments located over a garage. Among the many reasons to welcome more granny flats and coach houses to Tacoma, accessory dwelling units flexibly meet the needs of many household types—from first time homebuyers and young families to seniors aging in place. More ADUs and DADUs in Tacoma will make the city’s opportunity rich neighborhoods more accessible to those who could not otherwise afford or do not desire a stand-alone house on a large lot. Unless the D/ADU will be used as a short term rental, the Owner occupancy requirement has been eliminated. We believe relaxing this indefinite commitment and allowing both the main house and the accessory dwelling to be rented out is key to encouraging more owners to develop and legalize existing un-permitted D/ADUs. Accessory dwelling units (ADU), including detached (DADU) will be allowed in all residential zones. This includes converting a garage or building an apartment over a garage as well as new backyard cottages. However, all DADUs must have a permanent foundation. Sorry, no shipping containers or tiny houses on wheels are allowed. Previous code dictated the D/ADU design must match the style of the main home. The new code provides more flexibility. Under the revised rules, the design should complement the main home and be of equal or greater quality—great news if you are interested in a modern DADU or contemporary ADU addition to your home. 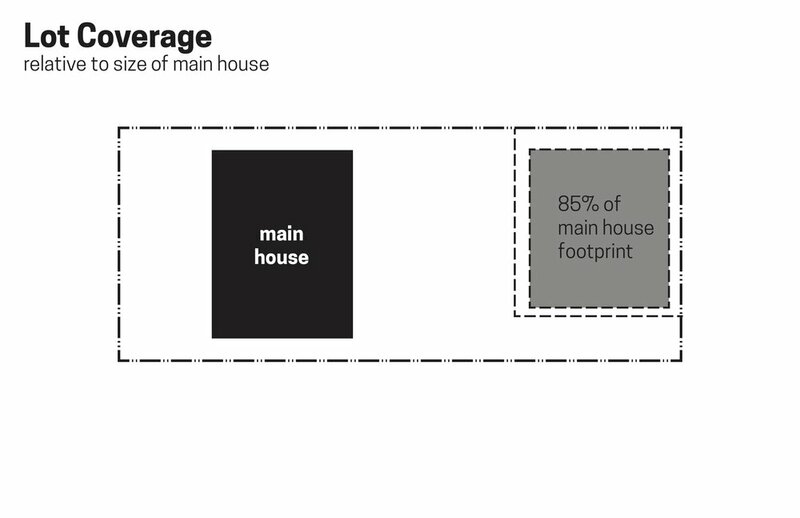 New code removes minimum lot size and dimension requirements as long as all other standards regulating overall lot coverage, yard space, location & setbacks are met (see diagrams below). However, the D/ADU must still be located behind the front wall of the main house. Existing structures being converted to a DADU will not be subject to setback requirements. 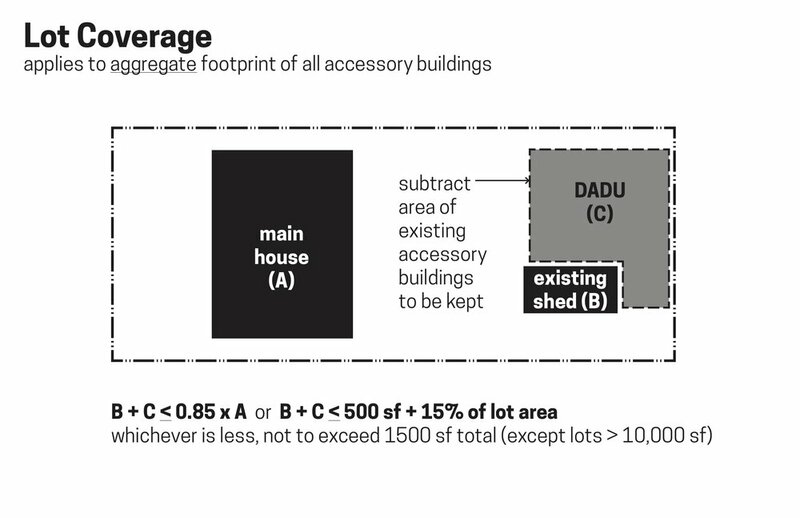 Maximum size of DADU is 1000 square feet or 85% of the main home, whichever is less. Height limit of 18’ may be increased to 20’ when the DADU is designed and constructed to Built-Green standards or located above a garage. Only one ADU or DADU per single family lot is allowed. D/ADUs may function as a home office or home based business subject to existing regulations. When both the D/ADU and the main home have business uses, only one of the two may receive customers. 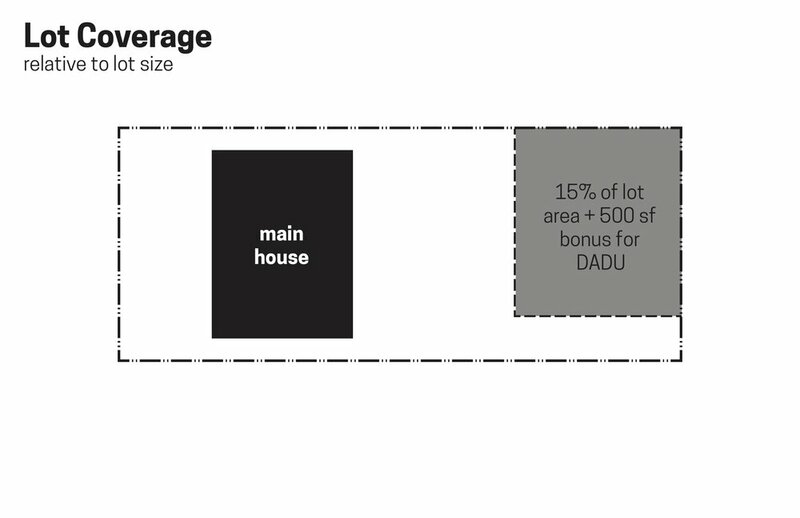 a closer look: WHAT SIZE DADU CAN YOU BUILD? No additional yard space is required for the D/ADU but minimum required for the main house must be preserved. Depending on lot shape and dimensions, setback regulations could limit the overall size as well. The general setback rules for some typical and less common configurations are pictured below. Additional setback rules apply where the D/ADU entry faces a side property line. ADU additions are generally subject to the same setback requirements for the main house. Existing structures converted to a DADU are not subject to setback rules, but must still comply with the building code. Still have questions about Tacoma’s new ADU regulations or want to talk about the specifics of your project? WC STUDIO can be a resource for you as you start planning an ADU or DADU design for your property. Check out an example of a DADU Feasibility Study or get in touch to schedule a consultation.